Real Stories! Amazing Adventures! : A Warhammer Production! Click here to download an excerpt from Thorn and Talon. 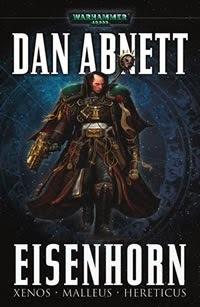 The Warhammer audiobooks were a refreshing surprise to my senses. I believed to have been well acquainted with well-made science-fiction and fantasy audiobooks, but discovered an exceptionally made production, in this case! In my excitement, I bring this report to you, my audience, before browsing deeply into the collection; which, by the way, spans over 30 stories! Of course, most of them are rather short. Some of those I have enjoyed, so far, were about an hour long. And what an hour it was! The production of the audiobooks includes clear narration by a professional, who does the characters very well, and music & sound-effects, according to the situation entailed. This mixture of grand production and refined stories, brings together some of the best fiction audiobooks available! The narrator appears to be British, or at least, he is well versed in their speech habits. I will post an update, when I find myself at the end of this wonderful collection, so stay tuned.